This book came about because Allan has had many requests for more early dance music. Many of the pieces in this book are from the Playford collections. The Playford collections were published in the early Baroque period, but many of the pieces in the books already existed in the Renaissance. They are used by dance groups and also by many people for Renaissance Fairs and re-enactments. 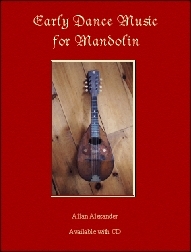 Allan also used other sources to have more of a variety of music. The Playford collections were always being revised, changed and republished. There is also detailed instruction on how to do the dances in the “Dancing Master.” The point of the music in this book is the same as always. Allan wanted to find pieces that you cannot stop playing, addicting you to the Music!